Plural for numbers ending in 2, 3 and 4 (except ending in 12, 13 and 14): złote, plural for all other numbers: złotych. Literally meaning "golden", is the currency of Poland. The modern złoty is subdivided into 100 groszy (singular: grosz, alternate plural form: grosze). 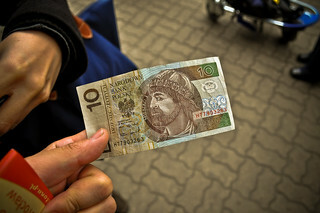 so this is 10 złotych, with a profile potrait of Mieszko I of Poland.